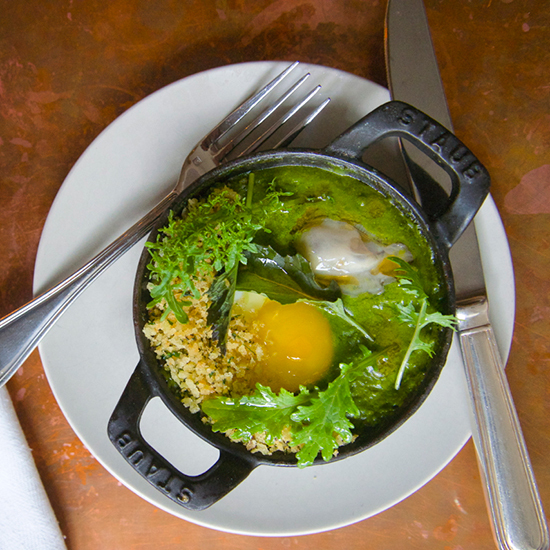 What: Green eggs have gone from book to TV show and now to actual brunch dish at this new Acadian-inspired East Village restaurant. Vegetarian gumbo z'herbes—made with all sorts of seasonal greens, then smoked to give it a bit of ham-like flavor—is the base for this dish with two baked eggs, herbed breadcrumbs and an oyster on top because, well, who doesn't want an oyster on top? Wash it down with: The Catskill Michelada, with Sicilian tomato juice and Barrier Kölsch.